The hotel is located in the very centre of the city. This location will surely make it easier for you to attend your business matters or visit the city. All the main institutions and tourist attractions are within easy reach from the hotel. We offer you tastefully furnished single and double rooms with private bathroom, telephone, radio and satellite TV. There is a Drink Bar on the hotel premises. Car park is located just 50 meters away. Hotel Lech, Poznan - 78 rooms with baths. Conference room for 20 people. How to get to get to Hotel Lech, Poznan? 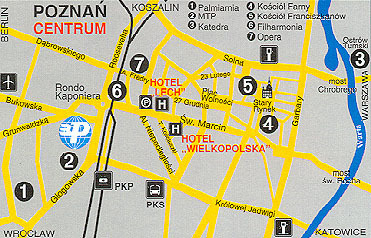 The Lech Poznan hotel is situated right in the center, within a 10 minute walk from the Main Railway Station.